Stained glass is found in churches and homes around the world, but it needs to be repaired from time to time in order to continue being a beautiful addition to your space. 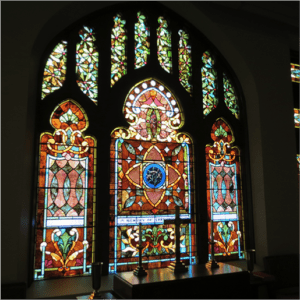 At McCully Art Glass and Restorations, we are the premier provider of stained glass repair in Indiana – from huge church windows to precious Tiffany lamps. Stained glass window repair can be difficult. Old windows can be fragile, but certainly in need of repairs as they continue to age. Here at McCully Art Glass and Restorations, we know the best way to restore your stained glass windows. Most repairs such as broken glass and loose reinforcing bars can be repaired while the window stays safely in place in your church or home. addressing small repairs now can prevent them from becoming worse over time. Structural problems with aging stained glass windows cannot be easily repaired in the comfort of your home or church. Fortunately, our team members at McCully Art Glass and Restorations are experts in gently and safely removing, transporting and satisfying the stained glass repair needs in your Indiana church or home. A common stained glass repair for older windows is re-leading. The lead in stained glass windows typically beings to deteriorate after 80 to 100 years, and windows older than that will likely be in need of repair. Our team is ready to help make your stained glass window look brand new with our careful re-leading process. Beautiful stained glass lamp shades are an excellent way to bring light and color into your home. However, as they age they may often be in need of repairs as a result of breaking, separating, and wiring problems. At McCully Art Glass and Restorations, we are able to rewire your lamp, as well as fix broken glass or separated crowns. We are ready to help you with your stained glass repair needs in Indiana, so you can keep your bright, beautiful lamp looking like new. Contact our team at McCully Art Glass and Restorations for more information on our stained glass repair services in Indiana, and let us help make your lamp or window shine like new again!